When the Beatles’ White Album came out, there were two old-fashioned, sentimental songs on that double set that were particularly endearing. One was called “Honey Pie”- a catchy, old-timey sounding ballad about a music hall star who makes it big in the USA while the lonesome British bloke who loves her is pleading for her to return to him back in England. Honey pie’s instrumentation was a little unusual for the group as John Lennon played both lead and rhythm guitar tracks while George Harrison, the usual lead guitarist, played six-string bass. A clarinet was also included in that charming song. At the time I wondered if there was such a thing as an edible honey pie, because I’d never seen an edible “cutie pie” either - but honey pie, maybe so. After not finding it in any cookbook, I went to the library where I happened to meet a Greek-American librarian who exclaimed that honey pies are very popular in Greek cookery. They are great pies indeed but they actually should be called honey -cheese pies since they contain a lot of ricotta or cream cheese in the pie filling. What I wanted was a plain honey pie but gave up after not readily finding one. A few months back the Tipster and I are at a garage sale where I notice a compact disk of the White Album. I picked it up and was reading the titles and when I sighted “Honey Pie” I once again thought about that pie I’d never baked. 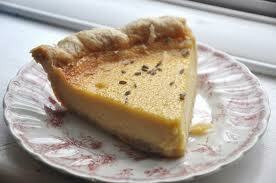 Am glad I did because after preparing one, I found honey pie to be a splendid pie and a treat you do not see everyday. If you like pies you are sure to enjoy this sweet delicious dessert. Blend all ingredients except crust in a mixing bowl. Bake 40 minutes and check if crust is set. If not, bake up to 10 minutes more. You can dress up this pie by adding a meringue, see here. For the meringue-topped honey pie, place the meringue atop the finished pie and put under the broiler briefly to barely brown the top. If you like sweets then you will enjoy this lovely honey pie, but not too often I hope. Interesting story about the honey pie. I had no idea there was such a dish. It looks delicious. TORVIEW: Yes, a little sweet but nice to have once in awhile. VAISHALI: Definately is not common but it is a sweet dessert. MIRIAM: Thank You, we loved it. CAYSERA: A little rich but delish it is. There is no such thing as a bad pie. Well, maybe cow pie. I love honey, this cake has a very musical name promises a delicious taste. AL: I thought they were called patties. LEOVI: I couldn't agree more. This recipe sounds great. Now, do you have one for a cutie pie? MISSED PERIODS: I wish But I have one on the side of my blog. Christina is five years old and home school educated. She is prepared to enter third grade. The honey pie looks and sounds delicious. I'll have to see if I can find a recipe for the greek version. I like both ricotta and cream cheese. Al has a point, but pie, real pie. I can be at your house in an hour. Start baking. SUSANNE: We found it to be very delicious. I'll bet the Greek version is good too. GENE POOLE: It would be pointless to disagree with Al. OK, I'm preheating the oven and putting on "The best of Alpha Blondy". That looks fab, thank you! ALEXIS: It is delicious, thank you for calling.